The band saw is typically the tool of choice when the woodworker needs to make accurate curved cuts in wood stock, no matter the thickness of the board. Band saws come in a variety of sizes, and band saw blades are available in a few different widths, depending on whether you need straighter or more tightly-curved cuts. Getting accurate results from a band saw can require some practice, and the tool often needs adjustments, particularly after a blade change. Learn how to get the most out of your band saw with these band saw tool tips. The band saw is typically considered as the ideal choice for making curved cuts on pieces of wood, but did you know that the band saw can do a whole lot more than just cut curves? A quality band saw can actually make some specific straight cuts just as well as a radial arm saw or table saw. The key here is that you need a quality band saw. In this article, learn the features you should consider when choosing a band saw to use on your woodworking projects. 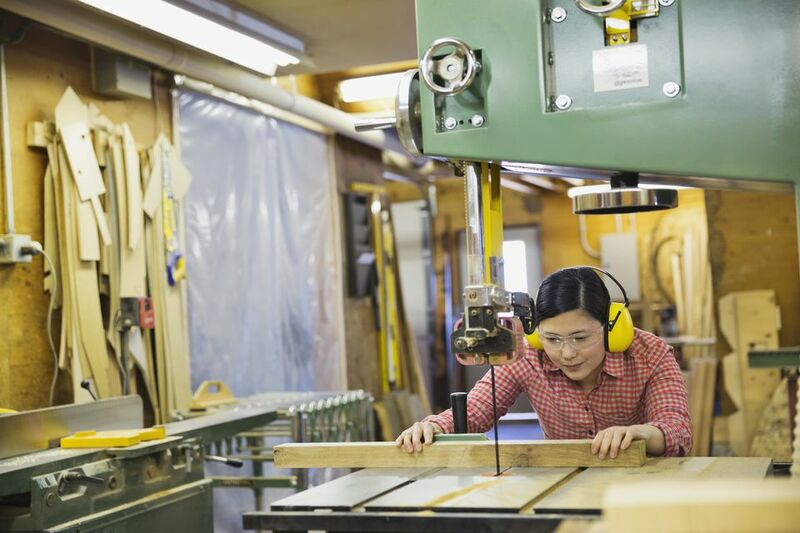 Woodworking power tools and machines all have an element of danger in using them, but some are statistically safer than others. One of these safer woodworking tools would likely be the band saw. 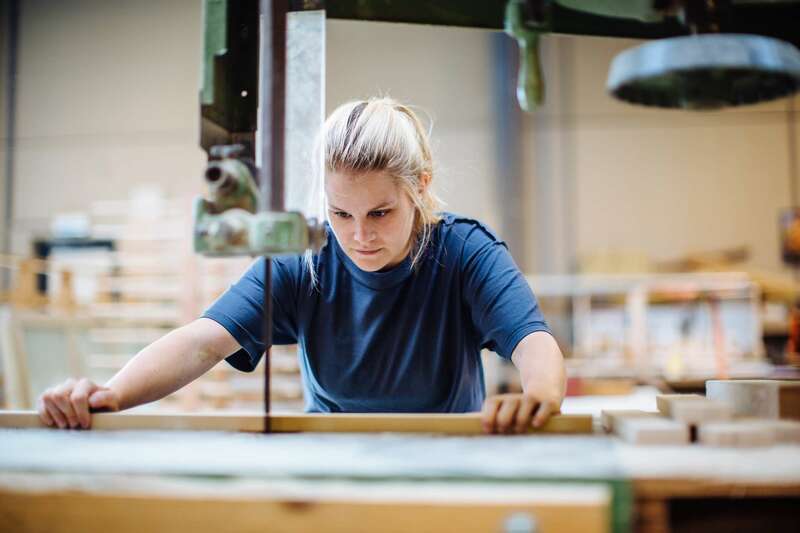 That isn't to say that it is completely safe, but by following the basics of band saw safety, you should be able to considerably reduce the danger in using a band saw. Learn these safety tips in this article. Band Saw Circle Cutting Jig. (c) 2010 Chris Baylor licensed to About.com, Inc.
One of the most difficult tasks one could try to attempt free-hand would be to cut a precise circle out of a piece of wood. Many woodworking projects (such as a table with a round-top) call for such a cut, though. How can you make this cut precisely and evenly? Try this easy-to-build circle cutting jig for your band saw. It sets up in minutes, and can be set up to cut a wide range of diameters. Download the free woodworking plans and build a circle cutting jig for your band saw today! Storing Band Saw Blades. (c) 2010 Chris Baylor licensed to About.com, Inc. Band saw blades come in a variety of sizes (for different saws), but they all have one very distinct thing in common: they're hard to store. This problem can be made easier by learning how to fold your band saw blades into manageable loops that can easily fit on a peg hook or slip into a drawer. Learn how to fold band saw blades in this woodworking tip. How Many TPI Should My Blades Have? Image courtesy of [Piotr Zawisza] / Getty Images. The number of teeth per inch (TPI) is often used as a rule-of-thumb for determining how smooth or fast the saw blade will cut. More teeth means a smoother (but probably slower) cut, whereas fewer teeth per inch equates to a more aggressive cutting action. In this woodworking tip, learn how to determine the ideal number of teeth-per-inch your saw blades should have for any style of cut. Applying Protectant. (c) 2010 Chris Baylor licensed to About.com, Inc.
Table saws, band saws and many other quality woodworking machines have tables built out of cast iron. The advantage of a cast iron table is precision and weight (giving the tool ballast), but the disadvantage is that cast iron is highly prone to rust, which can negatively affect the saw's performance. By following the simple steps outlined in this article, you can protect your saw's table from rust and keep it at peak performance. Saw Blade Burn on Oak. (c) 2010 Chris Baylor licensed to About.com, Inc. When cutting a piece of wood too slowly, or stoppping in the middle of the cut, the saw blade can cause a burn mark on the sides of the cut. While the first order of business should be to try and prevent saw blade burns from happening, there are also steps you can take to get rid of saw blade burns on the stock if they do occur. Learn some tips for dealing with saw blade burns in this woodworking article.